The latter half of January featured a stormy North Atlantic with a number of cyclones that produced hurricane force winds. An animation of RGB air mass imagery (below) from January 18-26 shows the active pattern. The most impressive storm rapidly developed and the central pressure lowered to 930 mb approximately 1200 UTC January 26th, see surface map below. Considering the strength of the storm, the OPC 96-hour forecast was exceptionally accurate. The GFS and European models were forecasting winds greater than 80 knots (90 mph) and wave heights over 55 feet. The ASCAT passes largely missed the strongest winds (highest observed were 60 knots (70 mph), but there were reports of waves near the Portugal coast between 90 and 100 feet, nearshore! On the RGB Air Mass imagery animation, you can see the red and orange shaded colors drawn into the center of the cyclone. This area represents warm, dry stratospheric air associated with high potential vorticity near a jet streak. As this stratospheric air is drawn into the storm it can be transported downward to produce high winds at the surface. 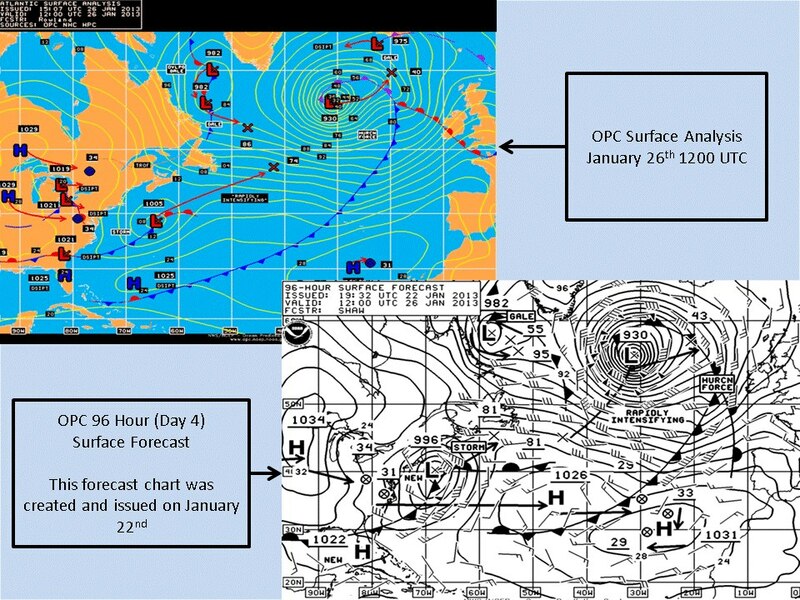 OPC surface verification vs. 96-hr forecast for the 01/26/13 North Atlantic bomb. One interesting note is the storm’s impact on the North Atlantic Oscillation (NAO). The NAO is used to characterize winter temperature and precipitation patterns in the North Atlantic through height/pressure anomalies over Greenland and the central North Atlantic. The index combines parts of the East-Atlantic and West Atlantic patterns identified by Wallace and Gutzler (1981). A positive NAO is indicative of lower heights in the North Atlantic and higher heights in the Central North Atlantic. 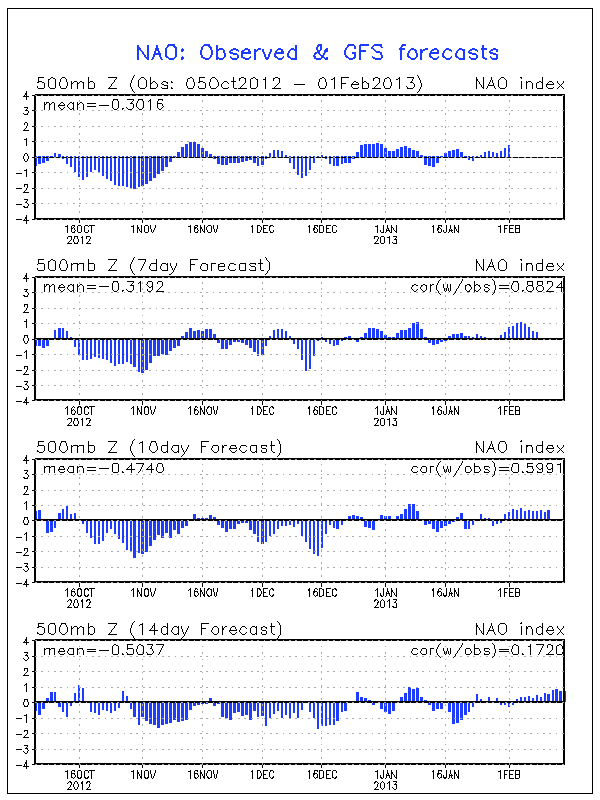 The top panel on the image below shows the Observed daily NAO indices for the past 120 days. Notice how the NAO index has trended positive since January 24th, and became more strongly positive with time. The intense cyclone reinforced the slightly positive NAO as the lower heights and colder temperatures infiltrated Greenland and the North Atlantic. So why do we care about an active North Atlantic and positive NAO? As the NAO trends toward the positive phase, it could mean above average temperatures for the Eastern US and Northern Europe. The CPC 6-10 day and 8-14 day temperature and precipitation outlooks both predict above average temperature and precipitation for the Eastern US, see http://www.cpc.ncep.noaa.gov/. The GFS NAO observation and forecast valid on 02/01/13. A special thank you to Dr. Emily Berndt (post-doc at NASA SPoRT) for providing much of the material for this post and to the OPC Facebook team for the surface comparison image.